On Corey's Bop Ragan Whiteside bangs out with flair making her flute to the ultimate carrier of emotions serving positive mood to audience worldwide. With the introduction by her child Corey Ragan takes the liberty to allow a personal note to flow into the album. With Early Arrival featuring prominent saxophonist Kim Waters Ragan pushes anew the feel good power button. The combination of a prolific artist with that jubilating instrument makes it very easy to follow this attitude. By the Moonlight shines with a sublime nurturing to the soul. With a rather short sonic motif Ragan creates a mysterious atmosphere that is skillfully evoked with precise flute tones. The Sun Came Up is a moment of rare natural beauty. Keyboardists Bob Baldwin and Dennis Johnson lay down a harmonic sound tapestry on which Ragan celebrates the tonal splendor of her instrument. The flowing melody is refined by decent overdubs and elaborate decorations in an elegance of unspoiled nature. On Let’s Do This the two nuclei Ragan Whiteside and Tom Brown on muted trumpet to an elemental fusion of Latin jazz. Ragan is not only a blessed jazz flutist but also an expressive vocalist, we can experience on I Never Told You. The title Flute Funk is somehow misleading. Ragan and Frank McComb create together magic with the spot on Brazilian swing in the style of Antônio Carlos Jobim. Especially when Frank and May Rose wave in that typical sing sang that is very close to the legendary Brazilian flair. When it comes to atmosphere, saxophonist Marion Meadows is a good address. Ragan and Marion show the full scale of their prowess on Love Song. A true master in every sense of the word when flute is the chosen instrument, Ragan excels on Mystic Vibration together with keyboard legend Phil Casagrande, whose solo is regrettably short. See you at the Get Down is the great final with a big brass section of Travis Kimber (sax), Marvin Pryor (trombone) and Nelson Render (trumpet) called the PR Experience. Merriam-Webster describes "Treble" as the highest voice part in harmonic music. 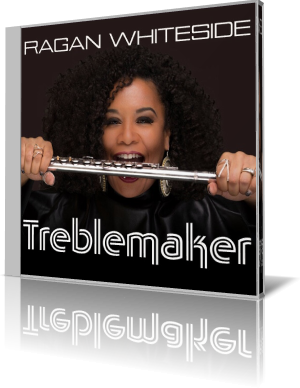 Ragan has entitled her album Treblemaker claiming the honorable position of the upper half of the whole vocal or instrumental tonal range. With her instrument in the mouth and the impish grin she also plays ironically with the role of a troublemaker. Both stands well to her face. Fresh wind for the genre.